Between November 1945 and October 1946, 22 high-ranking Nazi officials defended themselves before the International Military Tribunal in Nuremberg. 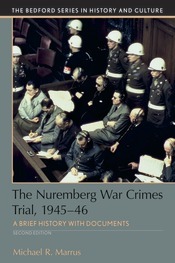 The new edition of this volume reproduces significant sections of the Nuremberg trial record, with a new introduction that outlines the background to the proceedings, traces the preparations made by the principle actors in the courtroom, and considers how the prosecution, defense, and the tribunal dealt with the counts against the accused. New documents include material on the preparation of the case against the German leaders, perceptions of the trial by a member of the American prosecution team, and a remarkable memorandum by Telford Taylor on the possibility of a future trial, focusing on the murder of European Jews. Along with the Chronology from the first edition, pedagogical aids for student comprehension include a new set of Questions for Consideration, and an updated Selected Bibliography. "This book is superb history, compellingly told. Marrus brings his lucid historical talent to the organization of the primary documents, which largely tell the story for him. This is exactly what the college student seeking a thorough (but not compendious) overview of the subject needs."